The Ultimate What-If of the Cuban Missile Crisis: What If There Had Been a Nuclear War? 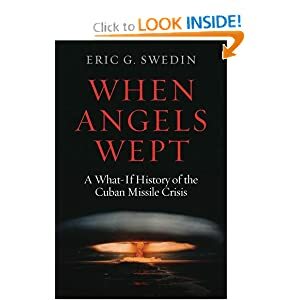 Eric G. Swedin is the author of “When Angels Wept: A What-If History of the Cuban Missile Crisis” (Potomac, 2010), as well as nine other books, and is an Associate Professor of History at Weber State University. His web site is http://www.swedin.org/. The fiftieth anniversary of the Cuban Missile Crisis just passed and America justly celebrated the event. Five decades ago, at the height of the Cold War, the world survived the most dangerous moment in human history. During the course of thirteen days, the Soviets and Americans confronted each other, but sanity won out and a deal was negotiated to end the crisis. After the collapse of the Soviet Union and the opening of historical archives, as well as participants speaking up, we have learned that the crisis was much more hazardous than initially supposed. The Soviets had four submarines in the Atlantic, each armed with a nuclear-tipped torpedo, and ambiguous instructions on when those weapons could be used. American naval vessels found some of the submarines and harassed them with noisemakers and grenades into surfacing. On Cuba itself, the Soviet troops were armed with tactical nuclear weapons, again with ambiguous instructions on when they could use those weapons. If Kennedy had followed the advice of the military and bombed or invaded Cuba, these weapons might have been used. While the American military knew that the Soviets on Cuba might have tactical nuclear weapons, they had no intelligence showing this and tended to believe that the Soviets had not brought such weapons with them. The chances for an accidental war were very high. Many of us might assume that people are more rational than that, but nations are independent actors and when they are playing chicken, unwanted outcomes are the norm. World War I and World War II both effectively started by accident in that none of the major powers were seeking a general war. What makes the Cuban Missile Crisis fascinating for me as a historian is not what happened, as grateful as I am that we all survived, but what could have happened. What if the U-2 flight that found the Soviet missile sites on Cuba, thus starting the Cuban Missile Crisis, had been delayed by just seven days? Many of the earlier reconnaissance flights had been delayed by too much cloud cover over Cuba. Because the time line of the crisis was dictated by how close the Soviets were to getting their strategic missiles on Cuba active, such a delay in discovery would have created a much shorter time period for decisions to be made. At the beginning of the crisis, the tendency of the president’s advisors was to be much more belligerent, and the longer length of the real crisis allowed emotions to cool and caution to prevail. A shorter crisis could have encouraged Kennedy to follow the advice of the Pentagon and resort to the bombing of the strategic missiles on Cuba before they became active and then to invade the island just to make sure that they had been destroyed. Removing Fidel Castro from power, who had already demonstrated his inclination to be a thorn in the side of American foreign policy, would have been a bonus. In my counterfactual history, because of the shortened time line for decisions, Kennedy follows the advice of the Joint Chiefs of Staff and Cuba is bombed. The Pentagon then implements its plans for an invasion, but the invasion fleet is destroyed by a Soviet tactical nuclear weapon and the world holds its breath. The Americans react to the loss of their ships and troops by dropping fourteen nuclear bombs on Cuba. Kennedy is assured by Air Force general Curtis LeMay that this will destroy all possible Soviet nuclear weapons on the island, a claim that LeMay could make because he was unaware that the Soviets had brought over one hundred nuclear weapons to the island with their troops. The crew of the remaining Soviet medium bomber on Cuba, absent orders from their superiors, retaliate by dropping their nuclear bomb on New Orleans. Quick messages are exchanged between the two superpowers. Khrushchev recognizes that because his own strategic forces are so much smaller than the American forces, that the only hope for the Soviets is to strike first. The Soviets have 25 intercontinental ballistic missiles that can reach the United States, while the Americans have ready 180 ICBMs that can reach the Soviet Union; only 110 Soviet strategic bombers can reach the United States and 1,600 American strategic bombers can reach the Soviet Union. In other classes of weapons, the United States enjoys similar advantages. It is a classic case of desperately opting for war because of a sense of weakness, instead of strength. My research led to an unexpected outcome. In 1962, because of the disparity of strategic nuclear weapons between the Soviets and Americans, a general nuclear war would have destroyed the Soviet Union and Europe, but only damaged the United States. Canada and the United States had strong fighter defenses, and Soviet missile-carrying submarines were all in port, so the United States would probably only be hit by less than thirty nuclear weapons. That is horrific, but not a civilization killer; in comparison, the Soviets took proportionally a similar number of casualties during World War II. Western Europe would be devastated by numerous shorter-range Soviet missiles and in return, the Soviet Union would be obliterated by over a thousand American nuclear weapons. The American war plan for nuclear war was politically inflexible, not taking into account that a global war might not include all communist nations, so in following the plan, China and other communist nations would also be hit hard by the Americans. Nuclear weapons were set to either explode high in the air, as at Hiroshima and Nagasaki, maximizing the range of blast effects, or on the ground, in order to destroy command bunkers and missile silos buried in the ground. 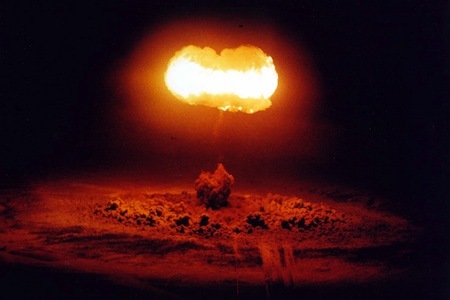 In 1962, the long-term effects of a global nuclear war would have been minimized because almost all of the nuclear explosions would have been air bursts in order to increase immediate damage and reduce fallout. For instance, the Soviets had no motivation for maximizing the fallout from their strikes on Western Europe, because the jet stream would have just brought that fallout to their own nation. The massive silo-building program of the mid-1960s had just began and had not yet forced a change in tactics. After the real crisis ended, the Soviets resolved to not be caught in a position of strategic weakness again, and so embarked on a massive buildup in strategic nuclear forces. Both sides also buried their missiles deep in silos, which meant that during a nuclear war ground bursts would be required to destroy those missiles. A general nuclear war, in which each side used its thousands of weapons, throwing massive amounts of fallout into the atmosphere, would kill human civilization. The proposed outcome that I presented in my book, where the United States would have survived, however weakened and shocked, would not have happened after the increased nuclear buildup. In the end, in an argument for what-if history, we need to remember that history may now be in the past, but at one moment it was in the present. Contingency is too often neglected by historians and other people. When thinking about history we assume that whatever happened was inevitable. This is a poor way to think about history and about why events unfolded as they did. Thinking about alternate outcomes of the Cuban Missile Crisis is an extended exercise in continency and helps us to imagine what the crisis must have felt like for people at that time ... and for what might have happened instead.